Looking to upgrade your PC? Might as well get some free stuff for it. Let’s be honest, your PC could probably be upgraded. Whether you’re rocking a top of the line rig, or your scrapping together from the ground up, the thought of a new video card is tempting. Well, the folks at Nvidia are making your decision a little easier by offering some sweet promos with their most popular cards. Starting on October 28th, those who purchase a GeForce GTX 660, 670, 680, 690, or 760 will receive download codes for both Assassin’s Creed IV: Black Flag and Splinter Cell Blacklist. North American gamers can also get a deal on the new NVIDIA SHIELD, knocking $50 off the price. Looking for something with a little more power? Don’t worry, there’s another tier for the bundle as well. 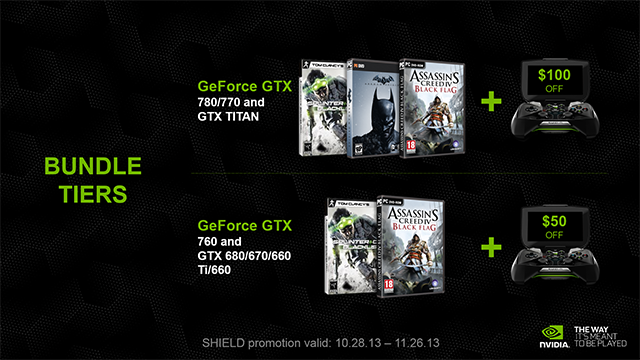 Those who purchase a GeForce GTX 770, 780, and TITAN will also get Assassin’s Creed IV: Black Flag, Splinter Cell Blacklist, but they’ll have Batman: Arkham Origins added to the bundle as well. 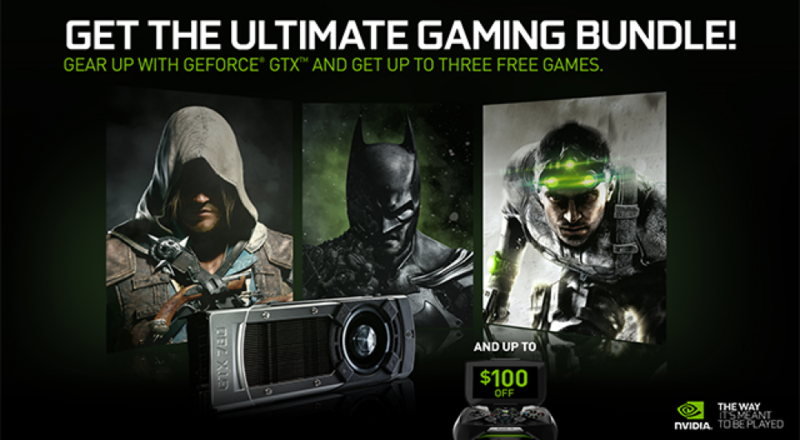 And to top it off, North American gamers get to take $100 off the price of an NVIDIA SHIELD. These three titles are sure to be award winners, and Assassin’s Creed IV: Black Flag specifically has a dizzying array of next gen improvements, and we can’t wait to see how our PCs handle the title. Head on over to Nvidia’s Holiday Bundle page starting on October 28 for a full list of participating e-tailers. Page created in 0.2515 seconds.